Gas-tungsten-arc welding provides excellent control and a focused arc to reduce problems commonly associated with welding thin materials, such as burnthrough or warping. The gas-tungsten-arc-welding (GTAW) process has long been touted for its ability to weld a variety of materials, as well as its capacity to create clean, high-quality welds with no sparks, spatter or slag. It also gains favor for applications using thin materials—sheetmetal 1⁄4 in. or thinner. GTAW produces a narrow, focused arc with good directional control and real-time amperage control, thereby reducing the likelihood of problems typically associated with welding thin materials, such as burnthrough or warping. The process, when completed properly, also can reduce instances of cracking and porosity—the entrapment of gas in a weldment. These same benefits hold true whether welding aluminum, mild steel or stainless steel. Following are answers to 10 frequently asked questions that can help metalformers increase their level of success when welding thin-gauge materials. 1] What is the best power source for welding thin stainless steel? Standard DC power sources, as well as inverter-based machines, will provide good results, but an inverter power source offers the benefit of reliable low-amperage high-frequency arc starts and a narrow, focused arc to avoid burnthrough. Set either type of machine to straight polarity—direct current electrode negative (DCEN). Also, consider a power source with pulsing capabilities for stainless steel—these machines can switch the current between high peak amperage and lower background amperage at regular intervals. Pulsing effectively lowers the average amperage level, to help reduce distortion while improving control of the weld-penetration profile. 2] Can the same power source be used for welding thin aluminum? 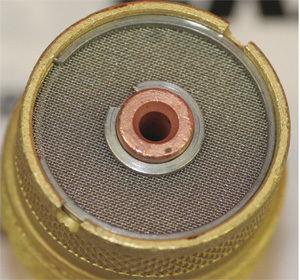 The screens in this gas lens help distribute shielding gas evenly around the tungsten electrode and the weld puddle. Aluminum welding requires a power source with AC capabilities. An AC/DC inverter provides the best high-frequency arc starts and directional arc control, as well as the ability (via balance control) to clean or remove the oxide layer on the workpiece surface. An AC/DC inverter also quickly initiates an arc at low beginning amperages, which helps minimize heat input to the workpiece and reduces the size of the heat-affected zone (HAZ). It also reduces the probability of burnthrough. For optimal performance, consider adding a remote current control, which allows a welder to optimally adjust and manage heat input. 3] What are the recommended parameters for welding thin materials? As a general rule, use 1 A for every 0.001 in. of material being welded by the GTAW process. For example, when welding materials 1⁄4 in. thick, set welding current at 200 to 250 A. When welding aluminum, the welder can adjust the amount of oxide cleaning and the width of the arc. While experience will guide his judgment, start with an AC balance of 70 to 75 percent electrode negative (EN) and 120 Hz of AC frequency. Those settings should accommodate the surface oxide layer while providing a smooth, stable arc with good directional control. 4] How important is part fitup when welding thin materials? Fitup is critical. To minimize heat input when GTA welding thin materials, ensure that the materials fit as closely together as possible. Gaps require the use of additional filler metal and heat input, which increases the likelihood of burnthrough or warping. If necessary, the welder can place small tack welds along the joint to keep the materials in place during final welding, or he can clamp them together to hold a tight joint. Fixturing offers yet another method to maintain fitup integrity during welding, and the mass from the fixture helps pull heat from the weld. This improves weld puddle control and minimizes the concentration of heat in the workpiece material. 5] What type of welding torch is best for thin materials? For welding 1⁄4-in. and thinner materials, select a GTAW torch rated 150-300 A. Air-cooled models cost less than do water-cooled torches, and do not require a separate cooler, which improves process portability. Air-cooled torches do, however, tend to be larger and heavier, and more difficult to maneuver. When using a power source with a water cooler—integrated or separate—instead select a water-cooled torch. These units, compared to air-cooled torches, boast a smaller handle and body, weigh less, and provide easier access into tight weld joints. 6] Are there any recommendations for optimum torch angle when welding? Welders should position the GTAW torch nearly perpendicular to the weld joint. The most common technique is to tilt the torch back about 15 deg. and push the weld puddle along the joint. This technique results in a symmetrically round weld puddle that concentrates the heat. circumferentially) protects against arc wandering, which can increase heat input to the base material. As with all welding, the key to obtaining good, consistent weld quality is finding a comfortable position. While most welders will determine the optimum technique that affords the best torch control, they should position their bodies to allow them to clearly see the weld joint and the tip of the tungsten electrode. They should keep the tip approximately 1⁄8 in. from the base material. This helps maintain a consistent arc length and prevents arc wandering, which could increase heat input to the workpiece. A consistent 1⁄8-in. gap from electrode to workpiece also helps maintain good shielding-gas coverage and allows visibility of the weld puddle, to help the welder control travel speed. 7] How does travel speed affect quality when welding thin materials? 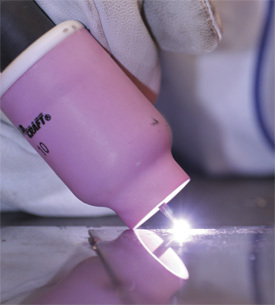 A steady travel speed is critical when welding thin materials. Weld too slowly and heat can build up in the base material, or the weld bead can grow too wide. Push the torch forward, as described above, so that the weld puddle remains slightly ahead of the torch and remains visible. The welder should move the torch, and add filler metal when required, at a pace that allows him to create welds whose width is approximately equal to the workpiece thickness. 8] Can a gas lens installed on a GTAW torch help when welding thin materials? Compared to a torch equipped with a standard collet body, a welding torch outfitted with a gas lens will provide better shielding-gas coverage and more evenly distribute the gas around the tungsten and weld puddle, without the need to increase gas-flow rate. Gas lenses typically are of brass or copper and contain layered-mesh stainless-steel screens. Improved shielding-gas coverage helps protect against pinholes or porosity, particularly at the start of each weld. In addition, gas lenses allow the welder to further extend the tungsten, improving access to restricted joints. 9] What type of tungsten should be used when welding thin materials? As a general rule, a pointed 2-percent ceriated tungsten works best on materials 1⁄4 in. and thinner, as it provides good arc starts at the low amperages needed when welding thin materials. This tungsten-electrode style also maintains a stable arc when welding in AC and DC modes, making it versatile for welding on aluminum, stainless steel or mild steel. Optimum tungsten diameter depends on workpiece thickness and the required welding amperage. A 3⁄32-in.-dia. electrode is the most common for 1⁄4-in. material. As a rule, a smaller electrode diameter produces a smaller arc cone and leads to more consistent starts at low amperages. Shops that primarily weld stainless steel might also consider using 1.5 percent lanthanated tungsten, as it provides good low-current DC arc starts. 10] What is the best to prepare the tungsten electrode? When welding on thin materials, grind the tungsten lengthwise to a point. 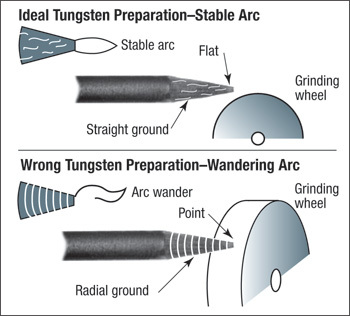 Do not grind around the tungsten, as it creates ridges that the arc will follow and increases heat input to the base material (see figure). Thank you for an informative post. I found point seven and the pictures particularly helpful. Although they are two simple things, they are extremely helpful.